This is part of a two or even three part blog about networking. Today, we’re going to cover, why network? But I’m looking for some suggestions and feedback for the next blog,to cover seven pitfalls and benefits of networking. So let’s start off with, why network? And we’re talking about business networks here. In business, as in life,you’re always looking for opportunities to find mentors,new clients, and making connections. Networking is a proven method of helping all these things,and is also great fun! and I’m finding great success in doing that. And I regard it as an investment in my business and in myself. So, what are the benefits and should I be doing it? Well like most things,not every networking group is going to suit you, okay. Some can cost up to $5000 a year, whereas others are free. I’ve found some great clients through networking and made some awesome friends as well. So I’m planning doing, like I said, benefits and pitfalls a little bit further on, so feedback is good. Hmmm, right, there are lots of free networking opportunities out there. they normally have little nibblies and so forth, so you know what, you should actually be paying. However, I have joined some free ones that have been very beneficial. So how do you know which ones to join? Join, attend a meeting, have a look, see if the people are the sort of people that you are comfortable with. See if there’s a good client profile for you and then carry on from that. So, what is the ROI? we meet at least monthly it gives me access to other Chambers of Commerce. than just tiny little sole operators. and you turn up for three hours, remember your time, you need to calculate,so even at $150 an hour, that’s $300 dollars. that’s how you look at the ROI. So always calculate it that way. So which one should you join? Try a meeting and find out, that’s the easiest way to find out what’s going to work for you. 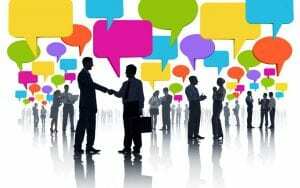 Local networking groups tend to want to work with local businesses. and referrals is what you are looking for. Networking is about finding friends, yes,but it’s mostly about finding referrals,and they are a rich seam of referral gold. So, dig in to networks in order to get those referrals. And if you’re not networking and digging, why not? Also, look at your industries. There are industry networks out there, industry groups. Join some of those, so that way you see what competitors are up to. Look at market trends,see what’s happening in technology and for forth. within your industry, and that can help you as well. And then of course,there’s the social aspect. that most of my networking and socializing during the day was through the work environment. Remove that, and you get less social. So, come up with something each day,and networking is certainly part of that. So it can help you with your social life and just mixing with other people. Mixing with other businesses. Remember they, a lot of them,started the same way that you did.